Osteoporosis is the term used to describe thinning of the bones. Osteoporosis itself is painless, but sufferer more likely to develop fractures, particularly of the hip and wrist. Compression fractures of the spine cause a loss of height and the bending of the shoulders, known as dowager’s hump, which affects many older women. Osteoporosis are generally thought of as a disease of old age, but there are many causes, some of which affect the young and previously healthy. To grow and mature normally, bone must be continually stressed and strained. Any condition that results in immobility will cause osteoporosis of the affected limb. This is common after severe fractures, and accident victims who have been in plaster for several months require careful physiotherapy if they are to avoid further fractures. This is even more true of astronauts, who have spent prolonged periods in the weightlessness of space. Several drugs, including steroids and heparin, have been known to induce osteoporosis. For this reason it is important that patients on these treatments to maintain a high calcium intake. Women suffer from osteoporosis because their ovaries no longer secrete estrogen, which helps to maintain the density of bone. The degree to which they are affected depends on two things: Their age at the menopause and the density of the original bone. For this reason, it is important to ensure that calcium intake is adequate, particularly in the last 10-15 years before the menopause. Bone density can be measured and this gives a very good indication of the likelihood of fractures occurring in later life. Unfortunately the test if not yet generally available. The disorder is generally painless and often the first indication is when a minor injury or ‘fall’ causes a broken bone. Olive Oil, Dates, Cheese and Honey - Make a paste with one teaspoon of olive oil, 2-3 dates, 2 tablespoons cheese and one teaspoon honey. Apply this paste on bread and give it to girls once a week from their early age to keep them from osteoporosis naturally. Sesame Seeds - Boil 1-2 tablespoon crushed sesame seeds in 1 glass of milk and drink it daily before going to sleep. Zinc, Iron, phosphorus, magnesium, fiber and calcium in sesame seeds are best to treat osteoporosis. Cheese – An excellent source of calcium to get healthy and strong bones. 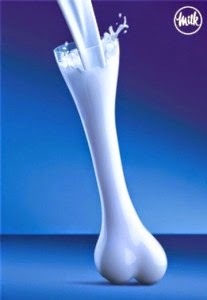 Milk – Low fat milk and yogurt are packed with lactose and sugar, which are highly beneficial for bone health. Butter – Excellent natural source of protein and calcium for strong bones. Green Leafy Vegetables – Fresh green vegetables are also the best source to get vitamin D naturally. Add daily in your diet plan. Citrus Fruits – Fresh fruit juice like oranges, pineapple, lime and lemon has very many important nutrients to improve the bone density. Vitamin C in these fruits is the best source to maintain your bones strength. Sardines with the Bones in Shellfish – Salmon, sardines, tuna and fish eggs are the best natural source of Omega-3 and vitamin D which is very much beneficial for strong bones. Almond and Figs - Almond and Figs milk shake daily for 2-3 months is the best natural source to get rid of this problem easily. Just soak 6-7 almonds and 2-3 figs in one glass of milk overnight and next morning peel off almonds and blend it. You can add 1 tablespoon of honey. Once the bone has thinned, it cannot be replaced, but if is possible to minimize the progress of osteoporosis. The first stage in the treatment is to remove the cause of osteoporosis where at all possible. However, in women who have reached the menopause, treatment is aimed at trying to preserve the remaining bone, usually through hormone replacement therapy (HRT). Most doctors would agree that any woman who has had a premature menopause (due to a hysterectomy, for example) or who has a family history of osteoporosis, should be on (HRT). A high protein, calcium-rich diet and regular exercise will all help to minimize the risk.